Rio Hato, R.P. October 17, 1946 Dear Mother, It's about three-thirty and we won't be going swimming for a little while yet, so I may have time to get off a note. We have been having a perfect time. Frank came up yesterday about noon & has to go back tomorrow. 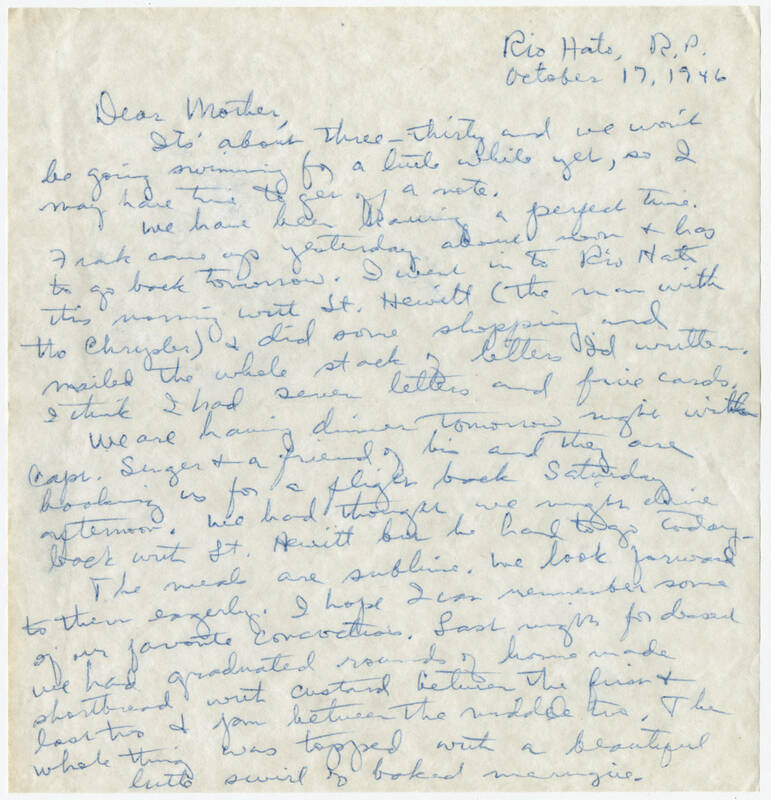 I went in to Rio Hato this morning with Lt. Hewitt (the man with the Chrysler) & did some shopping and mailed the whole stack of letters I'd written. I think I had seven letters and five cards. We are having dinner tomorrow night with Capt. Singer & a friend of his and they are booking us for a flight back Saturday afternoon. We had thought we might drive back with Lt. Hewitt but he had to go today. The meals are sublime. We look forward to them eagerly. I hope I can remember some of our favorite concoctions. Last night for dessert we had graduated rounds of home made shortbread with custard between the first & last two & jam between the middle two. The whole thing was topped with a beautiful little swirl of baked meringue.